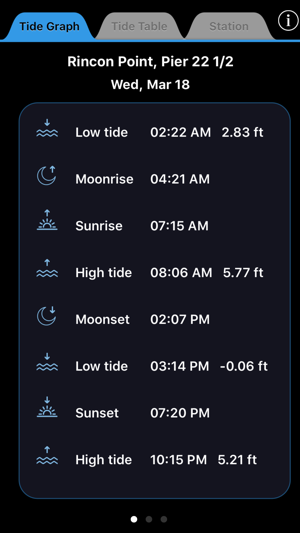 Not only does TideTrac tell you when a high tide and low tide event occur on a given day, it is the only app that can tell you the days of a month when the tides are highest or lowest in one quick glance with a graphical visualization. 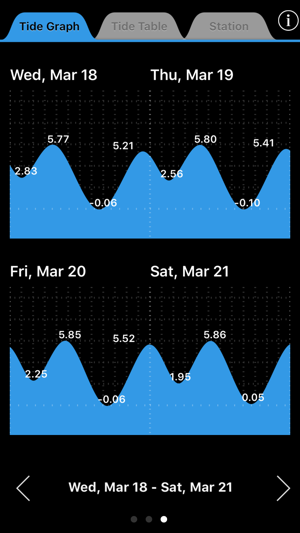 Swipe the graph to the right and view a four day preview of tide graphs. Add multiple tide stations to your favorites list and switch between them easily. Any station marked as a favorite will have their complete tide table downloaded automatically for the entire current year and will be available for offline viewing. Great for taking the phone with you and lookup tide data at anytime even when you don't have internet connectivity. On the first launch, TideTrac will automatically select the nearest station closest from your current location. But if you need to pick a different tide station, pick one easily from browsing the map visually! 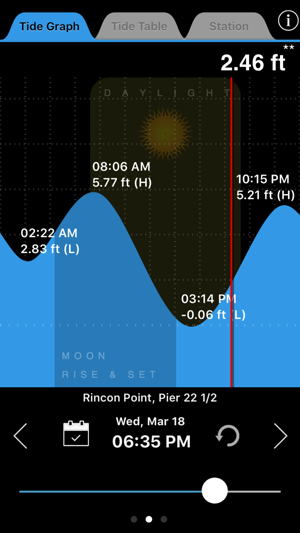 Advanced feature - TideTrac lets you lookup tides by hour of day (currently available on the iPad version only). For example, if you are interested in visiting the beach at 7 am for a walk, TideTrac can tell you on what days the tide are lowest and highest at this hour. Plan your visits or travel using the easy lookup table. TideTrac comes in a beautiful interface and also tells you the sunrise, sunset times, moonrise, moonset times. Whether you are going sailing or just planning ideal times to hit the beach or interested in finding the best times for viewing tide pools or finding the best times for fishing, knowing the tide level at any given time and day becomes essential. 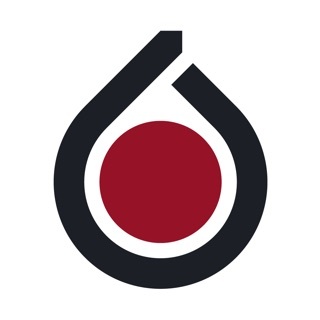 TideTrac presents all of its data efficiently without over-complicating the user interface. It is extremely easy to use. With the convenience of offline viewing, users can take TideTrac to remote locations and continue to view the tide predictions. + Includes thousands of tide stations in United States (coastal US stations only). 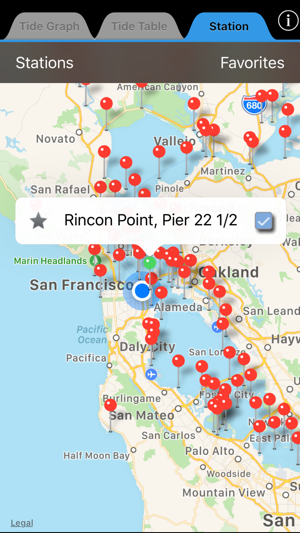 + View all tide stations plotted on a map for easy browsing and selection. + Add tide stations to 'favorites list' with one simple touch. + Offline viewing of tide events & tide graph enabled for all favorite stations. + Lookup tide predictions until 2021 (more will be added as available). + View high and low tides for the selected day. + View tide data for a whole month. + View highest tides of a month & lowest tides of a month. + View tide graph and using a time slider find the tide level for any time. 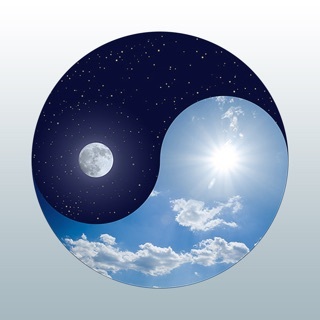 + Quickly shift from month to month or move from day to day and watch the tide change. + Requires internet connection only the first time a tide station is selected. + View Sunrise, Sunset, Moonrise and Moonset times. + Accounts for daylight savings time and different timezones. DISCLAIMER - Tide data displayed in TideTrac are based upon astronomical tide predictions and does not take into account the effects of wind, storm, rain, freshwater runoff, floods and other meteorological events. The tide graph rendered uses the predicted high tide and low tide events of the day and the segments between these tide events are approximated. Do NOT use TideTrac for NAVIGATION purpose or any other purpose that may result in personal injury or property damage. Use it at your own risk. Improved forecast and charts with few UI refinements. 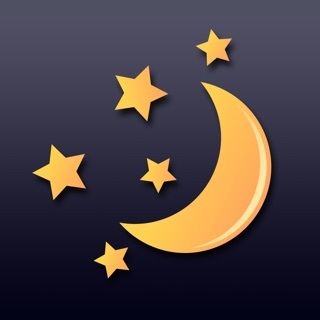 This is a very practical and useful app and I am grateful to the developers. The interface could be improved a little for 5 stars. 1. Faster way to selected a station close to you 2. Tide graph screen making it smoother to check tide for the night. Current screen cuts off at midnight but I am often interest in evening to morning (i.e overnight anchoring). A sliding graph would be fantastic or the behavior of the time slider could be improved when moving to the next/previous day so that it automatically moves to the left/right of the screen instead of staying on the same time. 3. Finally I would add a fixed current time marker to make it easier to think by difference the current situation. 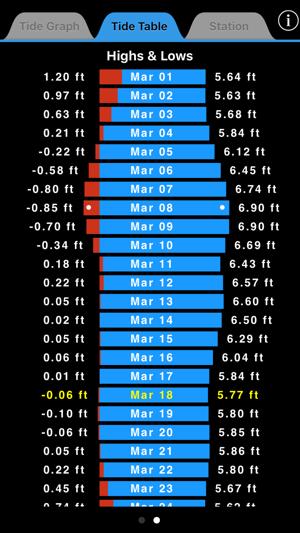 “big picture” in a bar graph of tides over the month (or as data in a table), see sun/moon rise/set info and change to other tide stations visually on map. It’s easy to use, attractive and blends graphics and numerical data really well. Really nice job bringing lots of powerful information without a complicated experience or overloaded screens. You simply select from three tabs (graph, table and station select) and then swipe to pan between pages of information. 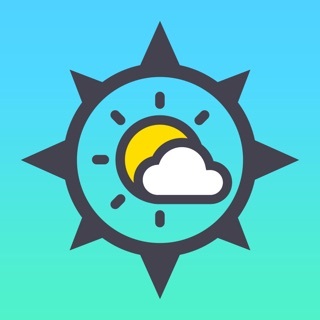 But while those items are desirable the app is really excellent and I use it constantly. I'm a landscape photographer who lives on the California coast and I LOVE this AP, I use it nearly everyday. I love the layout, ease of use, visual display, all are GREAT! 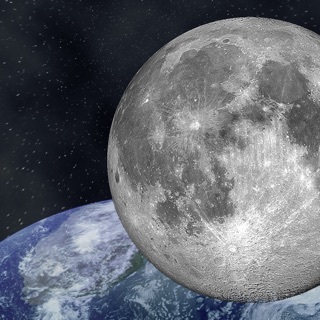 The only thing I really wish it had was more Moon details. This AP would be a 6 out of 5if it had The moon phases along with percentage of brightness and of course moon set and moonrise times. Something that would make this AP even more useful would be Swell data. But I'm getting picky. 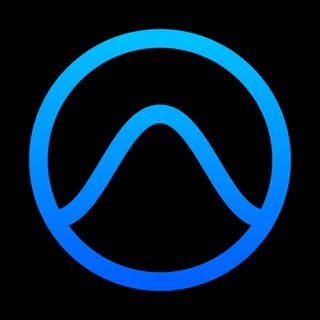 Are far as tide data goes it's been great, I highly recommend it!